E67e black for seat leon (5f) 2.0 tfsi cupra (280 hp / 206 kw) tubing chip. This product page has been automatically translated. If you have any questions, do not hesitate to contact us. For their seat leon (5f), 2.0 tfsi cupra (280 hp / 206 kw). Discover our top of the range for an unbeatable price. State-of-the-art components automotive cable carbon fiber gehßuse. Easy to install hardware the latest software version. Free delivery in the EU. 30 days full right of withdrawal. Strongest representatives of Germany in terms of chiptuning. Black e67e will enthrall the heart of each tuner. This combines the implementation with its well thought-out precision work and more clearly in terms of efficiency, torque and engine power. We are only satisfied when you are. 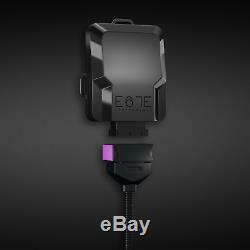 Therefore, we are tuning your vehicle with the most advanced solution in the debug chip range, the e67e black. The particularity of this tuning variant is the transfer of data without delay to the engine control unit. Thus, it is possible adapted to optimize your vehicle. The best possible result is therefore extracted from many factors such as the pressure, the amount of fuel injected or the intake pressure. Your benefits at a glance. So that you can install in your vehicle, our black e67e, does not require special knowledge or skills in the automotive industry. Even as a beginner in the tuning industry, you are integrating the chip using our installation documentation easily into your vehicle. Easy to integrate - start the engine - and enjoy much more power. Includes 2 year engine warranty. No worries because of any schßden. We want to give our customers to also order a positive feeling. Therefore, we provide all our customers for each product ordered an additional guarantee on your engine. Sintifying engine damage directly belong to the past. Our one year engine warranty takes effect automatically with your purchase and applies to all boats built in 2013 or younger. It does not matter whether the loader, cylinder head or crankshaft is affected. If proven damage by installing one of our products has been produced. The guarantee comes into effect. Your smartphone as a remote control for your car performance. E67e black, you have a control of your chips by app. Easily three speeds can be on the e67e performance app on your smartphone, select: eco: the right setting for economical city traffic, sports: the program of sturdy passage in fast turn race: the race mode for maximumperformance. In addition, the application may be a deactivation of the black e67e. Latest version 2019 parameter software performance parameters can be set usb cable. Waterproof automotive safety cap 64 mhz processor heat resistant. E67e black tuning box wiring harness for your vehicle installation instructions individual fasteners. Only a satisfied customer is a good customer. Every dissatisfied customer is definitely for us one too. Therefore, we are always striving for only better service and top quality products to offer. A simple installation of our products is therefore also a matter of customer convenience for us. A heat - resistant and resistant to special acid glass-reinforced plastic and einewasserdichte quality for chips, as well as associated cables, testifies to the quality of our products. However, want to avoid the inconvenience for you completely, so that the various components before the ßbergabe of our suppliers of our professionally trained technicians is carefully checked. Only if all features have been provided during this test, the device when you go out. We must not choose between improving performance or reducing consumption. We allow both e67e performance. Through our unique quality products are that simultaneous reduction in the benefits of consumption in addition to the desired improvement in your performance values ​​you. In combination with proper driving, you save on 100 km up to 1 l of fuel. Investment is a great value so quickly and durably in your chip tuning, because you sparenmit each tank of gas money. Cost of fuel to the optimization of 20 000 km. We clarify outstanding issues - advance. Draws an e67e my chiptuning performance engine more touched? Depending on the vehicle in question, you will register liters per 100 kilometers after installing the black e67e in your vehicle between 200 ml and 2.0. This savings is created by a slightly modified path, already a little earlier to the next gear, you can get through the increased performance. In addition the switching behavior is the actual economy also the respective vehicle engine design. Customers already satisfied declared as feedback a fuel reduction of nearly 1.5 liters per 100 kilometers. Cooperates a chip tuning e67e performance even with a diesel particulate filter (fap)? Yes, a vehicle with a built-in diesel particulate filter (fap) or particle filter is not an obstacle to installation. All our products are specially designed in such a way that particles of the optimal filter harmonize despite existing diesel with the vehicle in question. Where should I close the wire harness? Virtually all common rail systems have installed at the center or end of the common rail assembly for wiring harness vehicles on the market. A reduction in the life of the engine causes a chiptuning? It is after the longevity of your engine plus driving as shoring on my chip tuning cause. Because even without the focus, an aggressive driving style means a reduction in engine life. Can I install a black e67e in my vehicle? Vehicles with diesel engine powered almost all fit a chip tuning. On gasoline engines, it depends on the manufacturer and the model. On our homepage you find ßberblick in a precise, what our tuning vehicles come with a black e67e in question. Of course you have, but also the opportunity to get in touch directly with the data of your vehicle for us and our engineers will look at themselves individually, if a tuning chip of your vehicle is possible. Do I need a special fss chiptuning tool? In the development and manufacture of our products, we have emphasized on this the chip tuning without training or knowledge in the automotive industry are possible. There is another essential point that distinguishes our e67e black from other manufacturers' products. All you have to do is adapt the plugins for the serienmäßigenzustand and everything is back. This is the series, state of the function. With the removal of tuning chips and plug the original plug to power. In a workshop one would eventually but possibly via diode available before proven performance. That's right, but neither as evidence, yet a lapse of time from this specific data is normally done. Need more information on removal or have questions about the process, contact us. 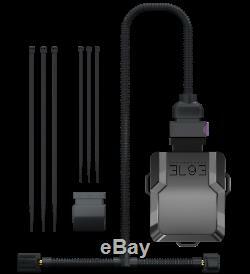 E67e black, autokabel, usb anschlusskabel, einbauanleitung, kabelbinder. 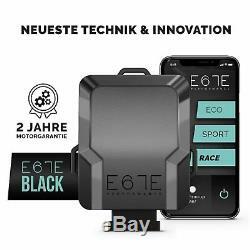 The item "e67e black for seat leon (5f) 2.0 tfsi cupra (280 hp / 206 kw)" is on sale since Friday, February 8, 2019. 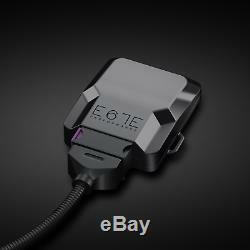 It is in the category "auto, motorcycle parts, accessories \ tuning , styling \ motors, chip tuning \ chips, chips ". The seller is "www-e67e-com" and is located in hirtenberg. This item can be shipped to the following countries: America, Europe, Asia, Australia.